Seller will give you a gift certificate in the amount of 3,4 RUB for a positive review of the product purchased. Solution of the C3 version 47 of Reshebnik on theoretical mechanics manuals SM Targ 1983. Homogeneous AU wood boards 15 P1 = H and BD (or BUsing) weighing P2 = H 25 are located in a vertical plane (Fig. S2.0-S2.9. Table. C2). 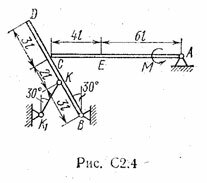 At point C or beams are supported freely against each other (Fig. 0-5), or connected by a hinge (Fig. 0-9). External relations are joint at a point A, a weightless rod KK1 hinge at point B (Figure 0-5. ), The projection H (Figure 6.) And the smooth plane (Figure 7 -. 9 at point B). On the boards except the forces of gravity are a couple of forces with the moment M = 50 Nm, and power that the magnitude, direction and point of application are shown in Table. C2. Determine the constraint reactions at points A, B, C, and K (Fig. 6 at the points A, C, K, and H). When the final calculations take l = 0,2 m.
Right after the payment you will receive a link to the zip file with a solution of 3 Static Var. 00 on the theoretical mechanics of Reshebnik Targ SM 1983 for part-time students. The problem is solved by a methodical instructions and control tasks for part-time students of thermal power, mining, metallurgy, electro-instrument-making, automation and technological specialties universities. The decision is decorated in a word format / pdf / less handwritten in jpg or gif. I would be very happy if after passing the solutions you return to the site and leave a positive review. This will help to make the service better. Seller will give you a gift certificate in the amount of 3,4 RUB for a positive review of the product purchased..